Things I should probably clean, but mostly likely won't (at least today or next week or maybe ever). 4. Underneath the kitchen sink. I don't go spelunking in that cupboard if I can help it. I'll gladly pay any of my children $10 to clean it out. 6. In front of the tall bookshelf where I keep all clothes to be ironed in a messy, wrinkle-inducing pile. I want to make sure the clothes really need ironing. No time today! I have one day off this week, and of course I've jam-packed the schedule with appointments (one of which is a painful reminder that I am a "woman of a certain age") and to-dos. So you'll hear no more from me today, unless I grab an internet moment while making a cake that I had for the first time last Saturday. We'll see if it works. And thanks to Marissa for introducing the goodness that is the pineapple coconut cake to me, and YES I EVEN ATE THE COCONUT AND I DIDN'T DIE. It was even really good! I have a case of the blahs that is threatening to turn into a full-blown woe-is-me episode. So in order to counteract it I think I need to remind myself of some of the happy things in my life. I'm trying for ten things, but we'll see if I get there without getting mushy and gushy. Cuz you know I hate that. 1. The living room has been much cleaner since I started keeping fake child's toys in the new sewing room (I wonder when I'll stop calling it "the new" sewing room?). The room is habitually much less cluttered and I'm calmer when there is less clutter. 2. I am keeping to my dinner menu plan this week. No bailouts yet! 3. 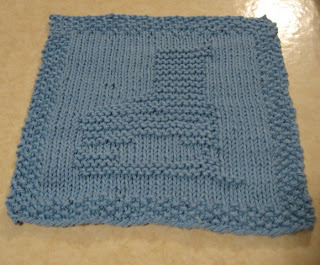 I've knitted three fun dishcloths in the last week or so since the January mid-month finished up. I think I'll save them for a giveaway for my first anniversary of blogging, which is coming up in early March. Don't you hate it when people make up words using "fantastic" and some other word? I do. But I still do it. Matt had pack meeting last night. I would have gone, but fake child's mother was scheduled to pick up fake child at the same time as pack meeting started. Plus it was another long day with fake child (and I have two more this week, making the week a full-time job). Yeah, excuses, excuses. But I have promised to go to the Blue and Gold dinner. It'll be the last one I ever attend (at least as a parent). Matt will be out of Cubs in October. 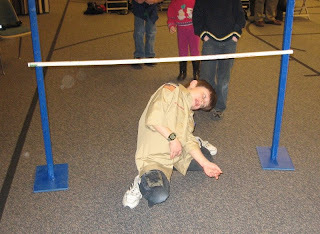 Jim took the camera with him and caught Matt in Limbo. How do his ankles survive that much rotation and stress??? Seriously, his back foot looks like it is nearly folded up against his leg! But not gushy or mushy. I try not to get gushy or mushy. We are getting back into having Family Home Evening (or abbreviated FHE, it's on Monday nights and it's a family togetherness night when we have a gospel-oriented discussion, sing a song, and EAT TREATS!). FHE with teenagers has been a bit of a challenge because of scheduling. Katie was always gone somewhere and now Jimmy works. Paul isn't in a sport right now, but when he is, he could be gone on a Monday night. And on and on. Many nights of "oops, we're too busy to have FHE" eventually turned into many months. But like I said, we are getting back on track. 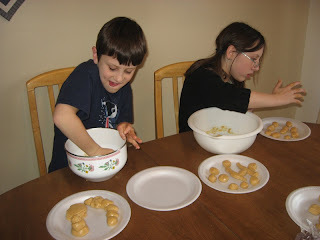 Last night, Hayley was in charge of the treats for FHE, which we pointed out to her on Sunday. She said, "Can I make gooshy mooshy?" 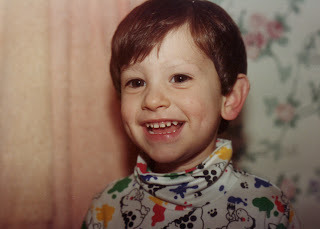 It's retro picture blog post day. One day before school, Jimmy was goofing around as usual. He really was a tough kid to get to school in those early years. (Now he does just fine by himself. He gets himself to seminary and does not have to be persuaded, begged, bribed, or threatened to go). So this one day, Jimmy decided to have fun with Matt. 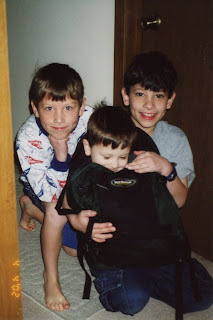 Matt really wanted to go to school too and they decided that Matt would just hop in Jimmy's backpack and go with him.And as you see, Matt fit quite well at the time. He really wanted to go to school. I couldn't yell at Jimmy much that day for goofing around. Here is one of my favorite childhood (not mine but Paul's) characters ever. Buckethead. Paul wore this around for several weeks when he was about 18 months old. Awwww. I miss my little boys. In other words, I should have stayed at home. Jimmy has a date tonight. (heehee!) Because MN has a law that prohibits teenagers from driving after midnight, I drove him to his date's house (they are going to a midnight movie) and his date's mom is driving them to the movie--and attending the movie with them. Tangent: According to Jimmy, AW's (Jimmy's date) mom teased them that she was going to sit in the very back and throw popcorn and scriptures at the two of them during the movie. I so wanted to do that too! I asked Jimmy several times if he wanted me there too. Guess what his answer was? Sigh. I want to be an annoying mom! We had a visitor! He wasn't totally unexpected, but we weren't sure if he was close enough to stop by. But he was! Jim's brother-in-law, Will, had a truck route up here and was in Inver Grove Heights, which is a hop-skip-and-a-15-minute drive from here. Will is a truck driver and has only recently had loads that brought him here to the Upper Midwest from California. Will and Jim met at church (youth activity night at church) and then Jim brought Will back home for a quick chat and to show him around the house. It was wonderful to see him--it's been quite a while since we've seen Will--nearly 10 years, Tammy and I were thinking. We saw Tammy and some of the kids last summer in Durango, but Will was trucking and couldn't make it. It used to be that I hoped and dreamed big things: that I would write wonderful stories or be a great teacher (when I was in 4th grade, I wanted to teach 4th grade) or be an astronomer (I loved the astronomy class in college). While I was in the one high school play, I dreamed that someday I would be an actress. Now I just hope and dream that I'll get some exercise and a shower before noon, that I'll get dinner made in a timely fashion, that the kids won't fight with each other and I won't feel like I have to yell at them for something, and that the living room will remain fairly clean for another day. And I'm fine with that. In which I survive a trip to see the doctor. I had a checkup today. Good news: blood pressure is significantly lower than when I saw the doctor four years ago. Bad news: She says I still have to lose weight. What does she want from me??? I just can't please my physician! At least I didn't cry this time. People who know me know that I have a very sensitive and fickle waterworks trigger. But I kept it under control this time and I didn't smear my light slathering of eye makeup on the hideous hospital gown. And I didn't relieve them of the every last tissue in the room to blow a drippy nose. The doctor asked me if I had tried a gym membership. I told her that I had but I gained weight over the year that I was a member and then quit. I said I could jolly well gain weight at home without having to pay for it. She chuckled. No this is not a post about our wannabe Senator's sofa. Can you say "cheap couch?" I can. Even through gritted teeth. Remember when I blogged about the stupid broken couch? (and by the way, this is the second time it has broken) Jim fixed it on Saturday. And then reinforced it yesterday. Wanna see what the underside of my couch looks like? Sure you do. This is where it broke the first time. 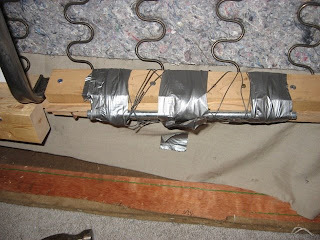 Sandwiched in all that wood, metal, and duct tape mess is a 1 x 4 that served as the support for the back of the couch--where the couch receives the most stress from hefty backsides. A 1 x 4. CHEAP STUPID (but oh so comfortable ) COUCH. This is the most recent break.See Jim. See Jim fix the couch. See Jim not get frustrated like his wife at the cheap manufacturers of furniture. And now our couch is cobbled together with bits and parts of past projects. One more section to break. But sometimes the things that I learn, I'd rather NOT learn. And I think Matt probably feels the same way. This morning we each learned something new. 4) that he is capable of putting out a small microwave fire by himself. 2) that it is possible to not yell at a child for something that was really an accident and thankfully did no damage. Some think witches use magic to turn people into toads. Children's choir on Thursday evenings is back in session--starting last night. It was the first time I'd been out of the house in several days. Last night, DM, the director, hosted a pizza party, which was a good thing because I didn't manage to put dinner on the table before we left. After the kids ate (DM and I chatted), one of the girls suggested a game to play, and it turned out to be a really funny activity. I would like to share the activity just in case you want to try this sometime. Sadly, I have to talk about the weather. Yes, it is cold. My little google reader app that tells me the temp says that right now at 8:45 a.m., the temperature outside is -25. Windchill is supposedly subtracting another 15 degrees. It is cold enough so that the schools are two hours late starting today. The kids are pleased about that. Paul used his extra hours to sleep and play a few minutes of Wii. Jimmy did homework that he left for today (we knew about the late start last night). Hayley and Matt slept in a little bit. And fake child will be late getting here because her dad's car won't start. It's a hot chocolate day. It's soup day. It's warm wooly socks day. A fuzzy sweater day. A curl up on the couch with a tattered quilt and a piece of escapist fiction day. A use the cats as foot warmers day. A go nowhere day. A leave the mail in the mailbox until tomorrow day. #26 My kitchen counter has an affinity for pieces of paper. It loves paper of any kind, any size, any purpose, but it especially loves notices from schools. And pictures drawn by Hayley and Matt. I cannot keep paper off this surface to save my life. No sooner do I remove the papers from the counter, but it immediately turns on its magnetic-like pull and the papers come tumbling from odd corners of the house and leap up onto the counter to be hugged and cuddled by the laminate surface that really should be reserved for the preparation of meals. The kitchen counter will not listen to me. As a side hobby, it also collects dust and food particles. After nearly two weeks, VOILA! We can go back to eating at the table. Tomorrow. I have to leave it up for now so Jim can see it when he comes home from work. This is in no way a complaint of things not getting done. It is just a list of facts. It is what is. 1. The couch is still broken. I don't want anyone sitting on it, but they do anyway. 2. The puzzle is still not done. But Jim and I worked on it last night and we are getting closer to being able to use the dinner table again as an actual dining surface. 3. My sewing machines are still not set up in the sewing room, but I'm claiming Katie's visit as an excuse. She used that room as a basecamp, although she did not sleep in it. 4. I'm still not down to my target weight for my doctor's appointment. 5. A book I purchased with a Christmas gift card is still only half read. I do plan to finish it. 6. I still haven't eaten breakfast this morning. Time's a-wastin'. 7. A Halloween pillow is still on the floor in my bedroom. But Katie's T-shirt has been returned to its owner, so progress has been made there. 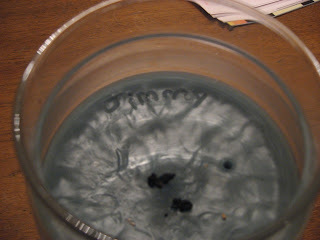 Jimmy is going to take this picture to school to show a friend. I told him he better not lose this picture and it better be returned in perfect condition. I love this photo. Jimmy was 2 1/2. Have I told this story before? On this blog? I know I've shared it many times verbally. One day before Christmas, I noticed that Jimmy's face looked off balance. I looked at his face for a little bit wondering what the deal was. The deal was he had SHAVED OFF HIS LEFT EYEBROW. His loving, but occasionally forgetful, father had left his razor on the COUNTER and little Jimmy decided to play with it. You can see that he took two swipes and cleared most of his eyebrow acreage pretty cleanly. After my legs regained their non-jelly-like state and I had calmed down sufficiently (I nearly had a heart attack at the possibility that he might have scalped his own brow ridge) I grabbed the camera to record the event for posterity. Katie went back to Utah. Her week here was full of fun and nagging. Guess who had the fun and who did the nagging? and I think I'm going to revisit the pizza I had for dinner. About six months after we got our little Magic and Servo (or four years ago), I developed a perpetually plugged sinus cavity. The doctor said I had to lose weight because my blood pressure was too high (and then as a side note, she prescribed Nasonex for the nose problem because she said the tissues were swollen per an allergic reaction and not from a viral cold). I cried because the doctor said I was fat. When my prescription ran out, I resorted to sneaking whiffs of Nasonex from Matt's prescription, rather than go to the doctor again and be told things that my fragile self-image cannot handle. When his ran out, I went to urgent care where I knew they would only deal with the problem I came in for and leave the other issues alone. This afternoon, I got a call from my clinic. 1. Katie has been going to her high school band class this week. And seminary. She has actually been on time for both, which I don't think ever happened when she was SUPPOSED to be going to both. The band director doesn't mind having her there I guess, although her little brother Paul minds somewhat because one of the other horn players says really loudly, "HEY PAUL, YOUR SISTER IS HERE!" And Paul doesn't "do" extraneous attention. Yesterday I was pondering the mom that I was 19 years ago. Being a mom way back then didn't involve much more than baby care (feeding, changing, and washing). Yes, I did get frustrated when the baby was fussy, but other than that, mothering was like carting a favorite toy around with me every where I went. I didn't have to argue with the baby over who got the last piece of cake, I didn't have to tell it for the tenth time to GO TO BED and QUIT TORMENTING THE CAT, FERCRYINOUTLOUD and STOP ARGUING OVER WHO MAKES MORE NOISE WHEN THEY SNEEZE. I didn't have to clean up after the baby, other than spit up--no toys, no backpacks, no books, no craft supplies, no Legos, no drawings, no jackets on the floor. I'm not saying it was easy, because it wasn't, but these days, I feel like my brain has been taken over by my children and all I do is wander around the house looking for ways to help them remember to be civilized people. When did I become a nag? I spent most of the day with Katie yesterday. She helped me shop for groceries, mostly by saying, "Mom! Get me some bacon! Mom, can we have fish sticks?" and repeating that she can't wait to have an actual real meal. Single people eat out of boxes over the sink, I guess. Then after the shopping, Katie wanted her hair cut. This is before.This is after. In the afternoon, I made all the kids who were still at home, everyone but Jimmy who had to work, help me with food prep for a family gathering at my mom's. 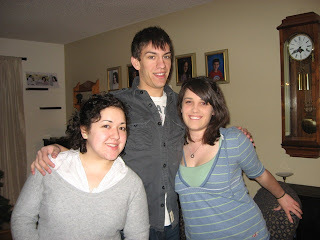 I was hosting, but Mom has more room at her house, so she was nice enough to let us meet there instead of at my house. The gathering was mostly so Katie could see family, but I brought a couple of cakes to celebrate her birthday, and anyone else's who wanted to be remembered. This is the kids' table. Someone chose to break the "kids only" rule, though.Mom just has to be a rebel and a rule breaker. She's back! We took her on a tour of the new room situation and she was duly impressed with the change. Jen, I showed her the book and she loves it! Pictures will be forthcoming, I'm sure. 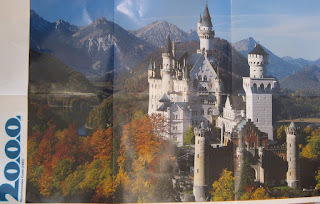 The New Year puzzle tradition continues at the shoebox castle, and what better image on the puzzle than an actual castle? This year, though, the kids haven't been too interested in helping. 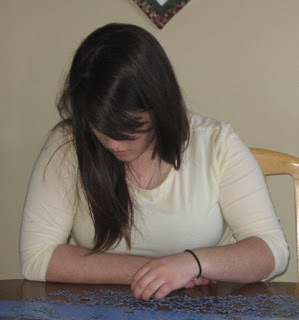 Katie has always been the traditionist and the avid puzzlist in the home, and she's not here! Jim and I worked on it on and off yesterday (I took a time out to go to Target and buy a bookshelf for the new sewing room). 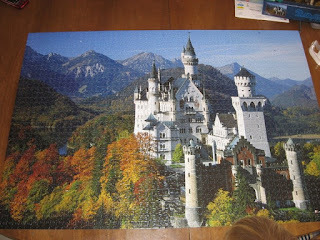 I watched "Firefly" episodes while puzzling and ate WAY too many peanut m&ms. Speaking of Katie, she comes home for a visit on Sunday. I fully expect a battle of ownership over vehicles, since she seems to think she will be larking about, visiting friends and former flute teachers. I may have to arm wrestle her for the van once or twice. Once upon a time in another blog-iverse (on the blog-planet CGB), I wrote a blog post about New Year's resolutions in which I determined that I was just fine as I am and resolutions were stupid because they were guaranteed to fail. I won't repost it here, because I wrote it as a different person and it's a bit edgier (inasmuch as I get edgy--I'm as edgy as a glob of Silly Putty) than what I usually post here. I still roll my eyes at New Year's resolutions. I can't even keep to a schedule for more than three days; what makes anyone think I can keep a resolution for the whole year? I was pretty pleased with myself for keeping up the Halloween Decoration Special Feature for a whole month, but notice I didn't try anything similar for Christmas!